Shenzhen Zhongshou Business Machine Co.,Ltd. 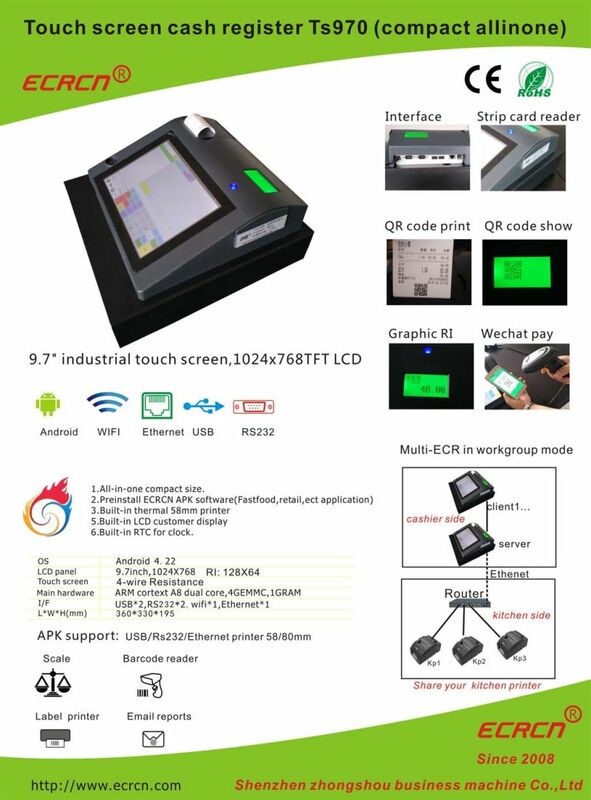 Embedded POS machines installed small ticket printer,customer display,card reader,cash drawer,truly integrated,so you have a machine in hand to solve all problems. Built in Dual core ARM-CORTEX A7 CPU. 4G EMMC flash, 1G DDR3 RAM. Android 4.22 OS. TS1512 APK preinstalled. 9.7" TFT LCD with 1024*768. 4wire resistance touch screen. 3*USB host for USB printer, USB scanner, or USB disk. 2*RS232 for RS232 device, such as RS232 printer or scale. Built -in magnetic card reader. Fixed with cash drawer (330x360x90,4b5c/3B5C,3positons).